The ellipsoid pod, clad in cedar shingles and constructed out of birch ply and European oak, is podmakers' luxury outdoor space. 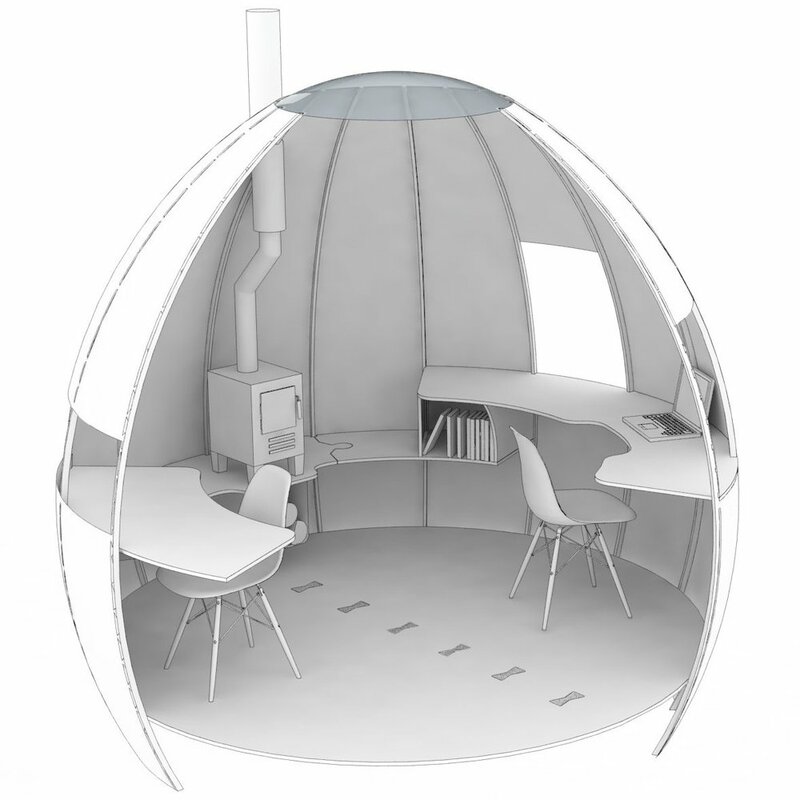 The Escape Pod's unique, organic shape and high-quality contemporary interior provides the perfect place to work, meditate, socialise or sleep. The pod has an aircraft style plug door and sits on a platform half a metre off the ground, allowing it to be rotated to catch the sun through its curved windows. With an adaptable interior, heating (woodburner or underfloor), electrics and insulation, the pod has the potential to be used as a garden office, snug or studio. Each pod is tailored to suit your needs, from the window placement and internal finish to the fittings and furnishings - the four recommended layouts are outlined below. The starting price for the pod is £19,800 but will vary slightly, dependant on style options - please call to discuss your requirements. Built with precision in the workshop, the pod is then delivered and installed using a forklift or crane. In a situation of severely restricted access, it can be assembled and clad on site. The pod adheres to planning laws, so planning permission is not required in most cases - advice can be provided. Easily seating ten, the circular bench and folding table makes the garden room a great place to socialise. With an upholstered bench and heating options, this is a very comfortable space to entertain or spend time with the family. Whether you are writing a novel or looking for a more productive home office environment, the escape pod caters perfectly. There is plenty of integrated storage, power sockets and enough room for two people to work. The comfortable snug has a raised 2.1x2m mattress to watch the stars through the domed skylight. 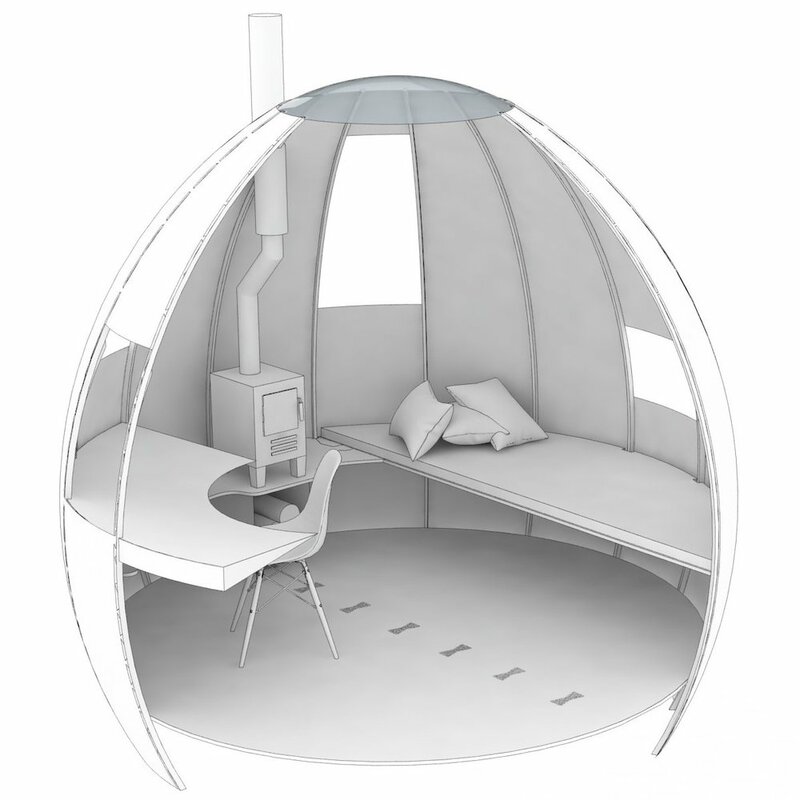 Alternatively the escape pod can be used as the ultimate glamping pod. Storage and clothes hooks can be included. Used as a studio, the pod offers a great space for an artist to work or as an escape to indulge a hobbyist. This layout includes a drawing table and day bed. Kit form. We offer a kit form version of our pods. This reduces the price to £17,900 and offers you the opportunity to be part of the making of your own pod. We do the main joinery elements of the pod, supplying you with a flatpack platform and the Escape Pod in 8 segments. This is then bolted together and clad, as shown in the timelapse video opposite. We provide extensive instructions and videos to aid you - it takes a competent DIYer 7 days to construct.